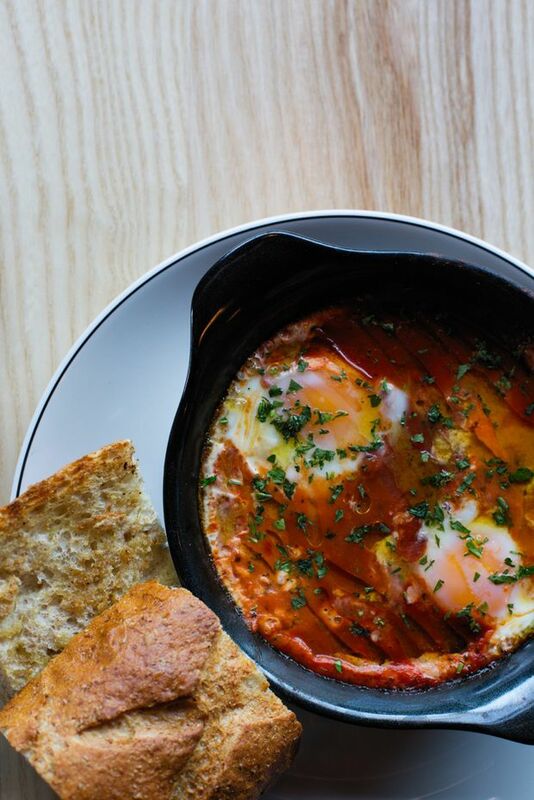 A dish of two slightly overcooked eggs and small balls of bocconcini covered in a mild and well-seasoned tomato sauce at Pip. Atmosphere: Small room with slightly awkward seating. Drinks on offer: Mostly cocktails, some wine. Best bets: Seared manchego, gnocchi, meatballs, eggs and bocconcini. Additional info: Open for brunch and dinner. If Pip were a person, she’d be that friend of yours whose behaviour is usually predictable, but every now and then, she surprises you. The owners of Edmonton’s homey Next Act Pub and the slick-looking smokehouse Meat bring us their latest concept, located on the same block, and it’s all about comfort food. Heavily decorated in flashy tile, from the seafoam green triangles along the front of the bar to the deep blue wall behind it, and boasting an overall modern look, the space is surprisingly cozy due in large part to its size. With 28 seats, it is one of the city's smallest contemporary restaurants, save the Alder Room. 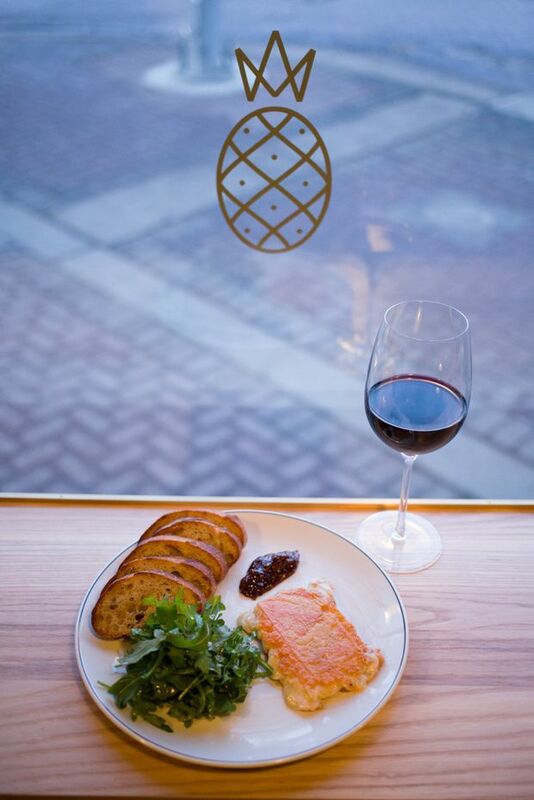 Its peculiar logo, a minimalist-designed pineapple, makes subtle appearances throughout the restaurant, which is open all day to serve brunch and dinner, both of which are satisfying in their delivery. A pineapple is more synonymous with tiki bars like Calgary’s Ricardo’s Hideaway or Miss Thing’s in Toronto than it is with comfort food, and here it doesn’t appear to refer to much aside from a simple dessert that appears on the restaurant’s menu. Something to ponder while people eat, I suppose. Breakfast is pleasant enough with free-flowing coffee, mimosas and dishes such as ricotta on sourdough toast with bananas and hemp seeds, or a traditional eggs Benedict, elevated slightly with the addition of dill in the hollandaise that’s spooned onto soft poached eggs. The eggs and bocconcini, also known as “eggs in purgatory,” is the Italian and less spice-infused equivalent of shakshouka. A mild and well-seasoned tomato sauce covers two slightly overcooked eggs and small balls of bocconcini in a blazing hot cast iron. To me, this is one of the most comforting brunch dishes and this offering falls in line with that sentiment. A thick slab of manchego cheese is seared until crispy and golden and served with a sweet fig jam and lightly toasted bread. The dinner menu embodies familiarity. Spaghetti, meatballs, gnocchi, roast chicken, beef short ribs ... it’s almost as if there’s a grandma cooking up a storm in the back for a big Sunday dinner. Grandmas, though, probably wouldn’t think of searing a thick slab of manchego cheese until it was crispy and golden on both sides and serving it with a sweet fig jam and lightly toasted bread. The handful of arugula on the plate makes for an unnecessary component to an otherwise tasty dish. The meatballs, as classic as any, come covered in the same tasty tomato sauce that graces the brunch menu and are topped with wisps of parmesan. Carefully cooked, they are tender and delicious, the last bite worth fighting over. Again, another odd handful of arugula graces the small dish and remains uneaten. In between plates, I sample the bar’s offerings. Pip’s Rye Level Bridge is the leader of the boozy pack, made with rye, Grand Marnier and Campari. It straddles the line between a negroni and an old fashioned and could easily appeal to lovers of either. I wish I knew, arugula. For a sugary finish, we decide not to opt for the (restaurant logo-inspired?) pineapple curd in a mason jar and go a more decadent route with Pip’s signature chocolate tiramisu brownie. The espresso liqueur-soaked lady fingers play nicely with the dense brownie base and rich layers of mascarpone cream, making it the highlight of the evening. In a restaurant world brimming with big and bold global flavours and dishes that seem to beg for the Instagram limelight, there is something oddly refreshing about sitting down for a meal that is simply, well, comforting.